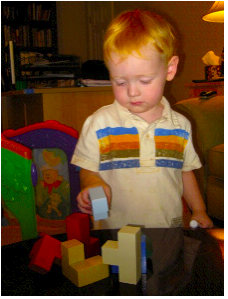 He’s just two years old and entering the building-block stage so grandad wanted to be sure he had a set of the seven Soma pieces in his learning environment. He plays with them when he chooses and arranges the pieces as he see fit. His mom reminded me that kids love color so I painted each of the seven pieces a different color. 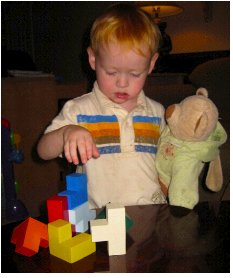 In this picture Asher is holding the light blue “Z” piece. It’s always more fun when you have a friend to play with so Asher has invited Bear, his constant companion, to marvel at the Soma pieces. … on top of the “Z” to create a stable structure. Until I saw the second picture of the “C” on top of the “Z”, I had never considered asking stability questions about Soma structures made from two or more pieces. If the only blocks Asher had in his learning environment were alphabet blocks (single cubes), then he could never have constructed the “C” on “Z” structure. Single blocks don't allow overhangs. If a single cube (see diagram below) is placed in the upper-left corner of the “C” on “Z” structure is the structure still stable? If the “C” piece is flipped horizontally (see below), is the structure stable? I think you can begin to see how easy it would be to explore with your kids and grandkids the stability of Soma structures. Just take the time to sit with them, build structures, and talk with them. Form now on, when I make a set of Soma pieces, I will include a few extra single cubes. Thanks Asher for helping grandad think some new thoughts about the seven Soma pieces and invent new ways to explore the pieces.